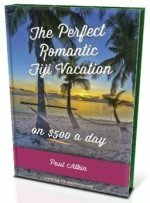 Need to get to your island resort in the Mamanuca Islands in Fiji? South Sea Cruises operates multiple daily routes to get you to your island getaway. South Sea Cruises offers a convenient and comprehensive Resort Connections Service in the Mamanuca Islands. With several fast and modern vessels operating transfers between Denarau Marina and the beautiful Mamanuca Island Resorts, you can easily get to where you need to go. Enjoy a full commentary as you cruise through the beautiful Mamanuca Islands. The Mamanuca Islands are a group of around 20 stunning islands just offshore near Nadi. That makes for a very convenient transfer once arriving on your international flight at Nadi International Airport. Below are the routes to your perfect island resort in the Mamanuca Islands! It's valid from 1st October 2013. * Not able to be booked online. Contact them to make a booking. 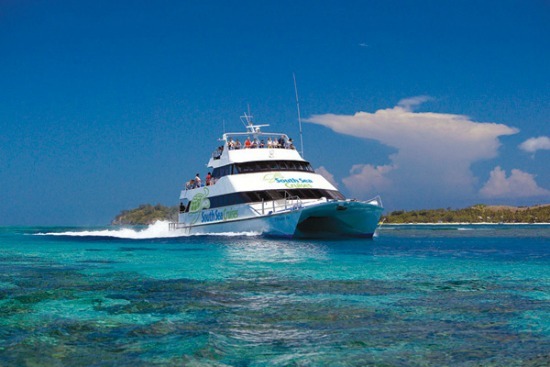 + Route 7 is serviced by the Yasawa Flyer operated by Awesome Adventures Fiji. Also, the times may vary on the day according to sea conditions and loadings. South Sea Cruises has free transfers from most Nadi accommodation to Denarau Marina. Inquire upon booking. As the check-in time at most resorts is between midday and 2pm, SSC recommends you have a leisurely start to your day by catching a mid-afternoon departure if possible, i.e. 3:15pm, 3:30pm. Afternoon departures are generally less crowded and it saves you waiting around for your room to become available at your resort. Note: Child rates are for children aged 5 to 15 inclusive. Prices are in Australian dollars (AU$). These prices are correct at time of writing November 2013. South Sea Cruises can change their fares at any time. All reservations visit their booking section on their site at South Sea Cruises - Island Resort Connections section. 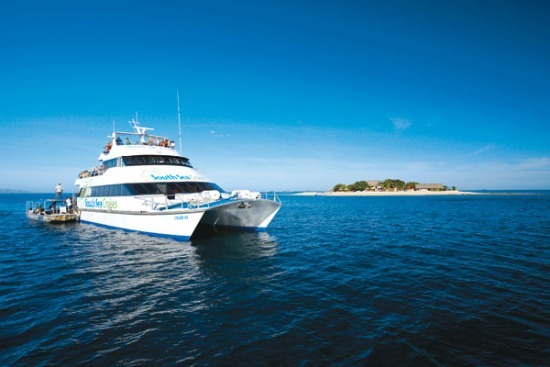 South Sea Cruises is Fiji’s leading maritime operator offering a range of spectacular Day Cruises and Island Resort Connections in the Fiji Islands. Sail the Mamanuca Islands onboard a classic schooner, Seaspray, visit an island paradise for the day or cruise through the Mamanuca and Yasawa Islands on a high-speed catamaran.